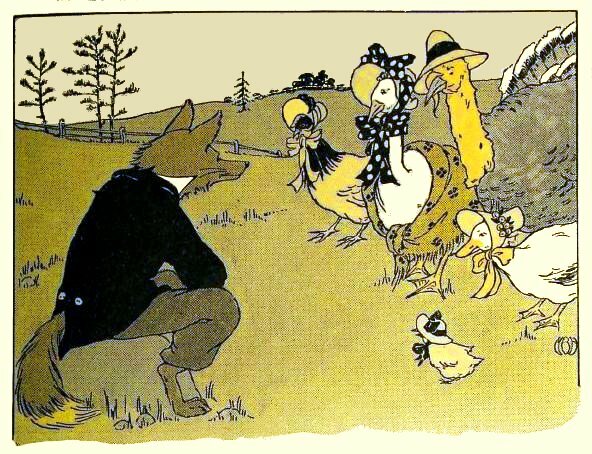 Politicians Take a Vow of Poverty (a Fantasy in Three Stanzas). Remain a fragile object, made of moon beams and of dust. Leaves the body politic both gullible and weaker. If elected, my first impulse is to laugh away. As promise to give up a single solitary cent. When they ran for office – think of what might come to be! With lobbyists thrown out of work and stealing from birdfeeders. It doesn’t follow any kind of reasonable norm. 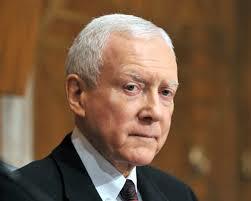 And doesn’t give a hoot what the opposing party thinks. It wants to change the subject to “Effects of Dry Rip Tide”. Like “Republicans for Ethics While Line Dancing Cheek to Cheek”. Will fool the public easily and keep watch dogs misled. The title to a label giving joy – such as “Free Beer”. 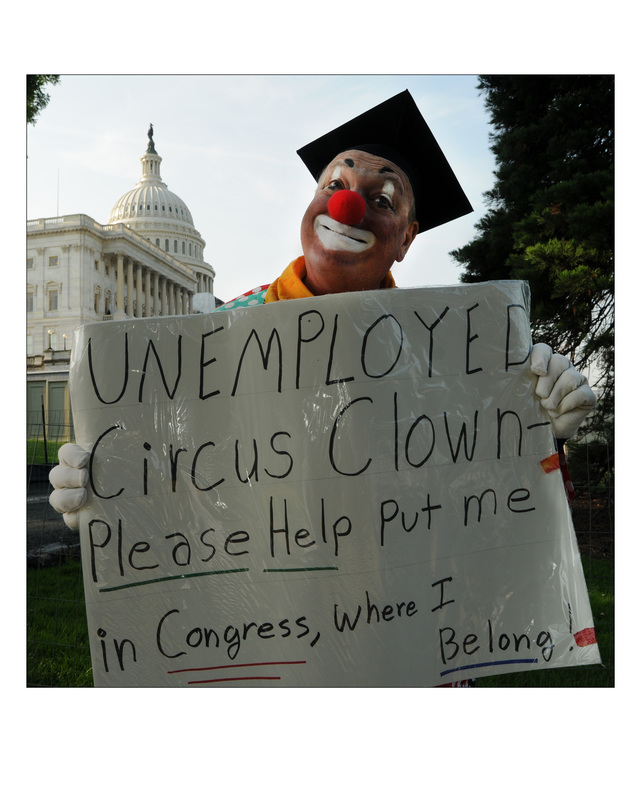 A Clown in Washington D.C.
January 7, 2015 January 7, 2015 iwritetheblogggs Congress, Humor, Personal Essay	clown, Congress, lobbyists, Washington D.C. 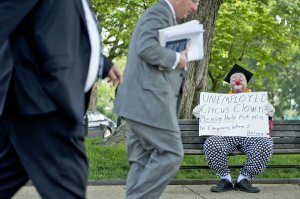 I retired permanently from clowning just about three years ago. I started at the age of 17 with Ringling Brothers, back in 1971. In the summer of 2012, though, I became a protestor. One of those wild-eyed fellows people cross the street to avoid. How was that my swan song with clowning? Here’s how it happened . . . I was staying with my daughter in Woodbridge, VA. And I had been out of work for a long time. Desperate times call for desperate measures. An idea I had toyed with for several years, a mere whim, came back to me in force and I decided to act on it. 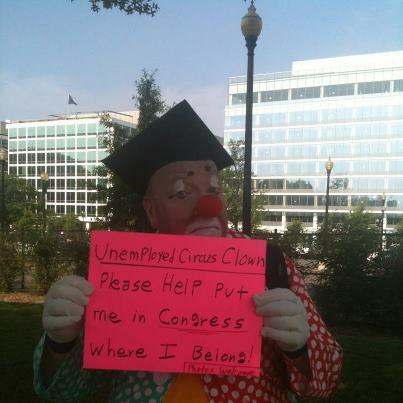 I rousted out my clown makeup and costume, found a piece of poster board and a marker, and took the commuter train up to Washington D.C.
“Where are you from?” Originally from Minnesota. “What does your sign mean?” Just what it says, sir. 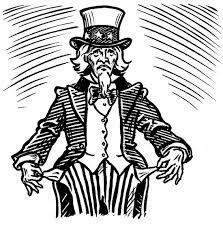 “Are you panhandling for money?” I am making a political statement. 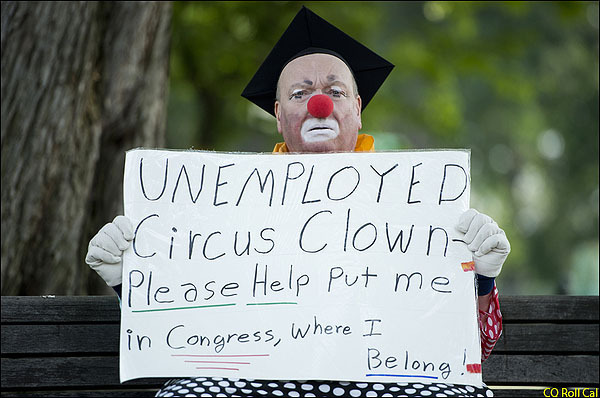 So they had to let me go, and I sat on a bench on Capitol Hill with my sign, in my clown makeup, and silently watched the political world go by. There were members of Congress. Government Bureaucrats. Joggers. Well-dressed lobbyists. I waved at all of them, giving out with my patented buffoonish grin. And tourists – lots of tourists. Every high school tour group that came by stopped for a photograph with me while their teacher/chaperone explained the wonderful privilege American citizens had to do the kind of crazy thing I was doing right in front of Congress. The students covertly handed me part of their spending money when their chaperones weren’t looking. Chinese tourists came by the busloads, and swarmed up the Capitol steps like an invading horde. Very few spoke English. But when someone would translate my sign for them they became highly interested in being photographed with me. When they were herded back onto their bus they always insisted I stand by the driver while they took up a collection to hand to the driver to hand to me. To this day I wonder just exactly what they thought of my little stunt. For all I know my photograph is now in the Ministry of Foreign Affairs Archive in Beijing. Of course I was not the only eccentric strolling around. There was a man whose sign was practically a novel – the gist of it was that the CIA had stolen his wife away from him in Ghana. Another man strode vigorously around the grounds, dressed in a Revolutionary War costume. He merely wanted to shake hands and play Yankee Doodle on his piccolo. I saw several people attempt to pass out handbills, but they were hustled away by the police tout suite. Summers in Washington D.C. are punishingly hot and humid. My clown makeup only lasted about three hours before sweat began to dissolve it off my face. 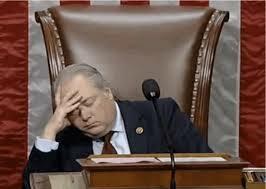 And I had to start taking a diuretic for my edema, which meant finding a men’s room pretty darn quick some days; and the guards wouldn’t let me use the ones in the Rayburn House Office Building. 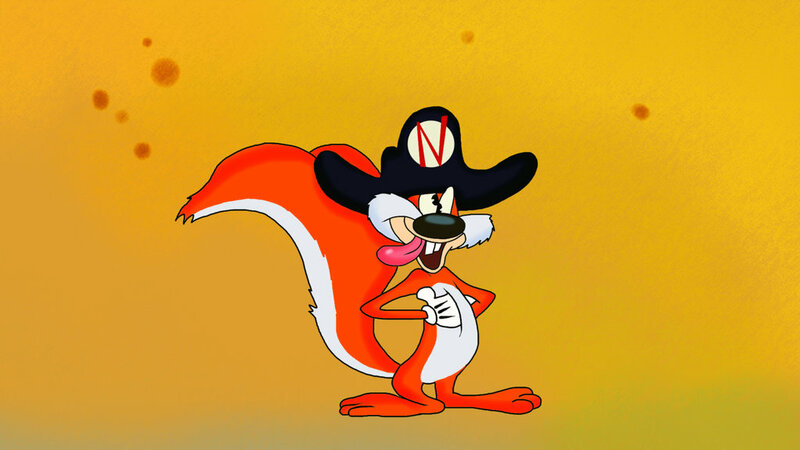 So in August I quit my loony vigil. My plan of being offered a job by some well-heeled entrepreneur impressed with my Frank Capra-esque display had not panned out, anyway. After deducting expenses for train fare and meals I wasn’t doing all that well, either. Eventually I found other work and moved away from the East Coast. 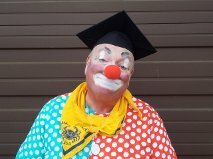 I gave my clown props and makeup to some of my grandkids, with firm instructions to come to me before trying to use any of it. Now I call myself semi-retired, writing content for websites. And by the way, the United States Botanic Garden is really outstanding. And free. I highly recommend it when you’re touring the Capitol. You’ll find the rest rooms especially clean and quiet. The congress will erupt with volcanic ferocity. They’ll process him until he comes out all pistachioed. While Chicken Little says the sky will fall, oh yes indeed! Maybe they will lynch him or ride him out upon a rail. And maybe they will rush him and deposit him in jail. To let so many aliens stay on this side of the border. And pull up Michelle’s garden, not excluding all her chard!